Our students in grades 3-5 will begin participation in the Illinois PARCC State Assessment next Monday. Help the PTA decorate the main entrance and side entrance (Kindergarten door) Friday April 6th after school from 3-4 PM. 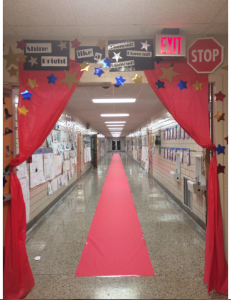 We’ll give the kids a red carpet arrival on Monday morning! All decorating supplies will be provided — just bring yourself to help us decorate. Sign up for this event by clicking HERE.